UBC Press and I recently held a launch party for Planning Toronto, my book on Toronto’s planning history, and a stimulating evening it was for me, interacting with so many of the people who had helped in the book’s birth and development. One person I could not talk to, but whose name came up in several conversations, was Eli Comay, a planner at the heart of Toronto planning affairs in the 1950s and 60s who had been central to the book’s genesis some ten years ago but who had died in 2010. The launch brought him vividly to mind. I first approached Eli in 2002, when starting what would turn out to be years of research into Toronto planning history. He was quite willing to meet and talk, so we did, then and later – maybe once or twice a year for the next four years. At first he served mostly as a source of information, but as my knowledge grew he became more of a sounding board for my developing ideas. In both capacities he was invaluable. He was a truly unique man, possessor of an extraordinary combination of opposites: folksy but erudite, candid but private, a teller of both stark truths and tall tales, to name only the first few incongruities that come to mind. I was not always sure what to make of what he said, especially at the start of my research when my ignorance left me so vulnerable – those English planners in Toronto, he said, always had three initials – but from every meeting with him I came away having learned something. We always met in the same place – SpaHa restaurant on the north-east corner of Spadina and Harbord, a short walk for him. He was living at the time in a small house – it seemed like a garage – off a back lane in the residential area now generally referred to as Harbord Village. He told me he used to own the whole house, but was so hard-up now that he had to live in the garage. I never knew the real story. Eli Comay was born and raised in Detroit, in what he described to me as a working-class Jewish world with parents who were avowed communists, a political stance he too adopted as a young man. After graduating from university in the early 1940s he enlisted in the American military, became a radio operator, and was posted to England, where he remained for the duration of the war. His wartime service could not have been too eventful for his principal recollection is of the high quality of English newspapers, which he began to read obsessively. There, in print, he encountered the now-celebrated New Town plans for postwar London, and this prompted him to learn more about the plans and what they were trying to achieve. His professional career thus was born. Back in the US after the war he enrolled in a planning program at the University of Chicago but, finding it inadequate, somehow managed to transfer, mid-term, into a similar program at the Harvard School of Design, which he completed, receiving a Master of Community Planning in the late 1940s. He then returned to Chicago to work for the Chicago Land Clearance Commission (the name says it all, he noted), but before long he and his wife, an active communist, felt the pressures of McCarthyism and had to leave the country, settling in Montreal where Eli found a job marketing radios – which he thought was a fitting job for a communist agent. Comay had by this time come to know Walter Blucher, head of the American Society of Planning Officials, and Blucher, as one of Metro Toronto’s early planning consultants, now knew Metro Chairman Fred Gardiner. Aware that Metro needed planners, and wanting to help Eli return to his profession, Blucher recommended Comay to Gardiner and before long Comay was hired. He moved to Toronto with his family in 1955 and remained there for the rest of his life. He was one of three new senior Metro planners hired at that time, the other two being Murray Jones, the planning director, and Hans Blumenfeld. This is not the place to recount Comay’s full career, which was long, and varied. But surely his greatest planning achievement does deserve mention: the 1959 Official Plan for the Metropolitan Toronto Planning Area, one of North America’s most fully conceived regional urban plans. Others contributed to it, notably Hans Blumenfeld, but Comay pulled it together. After months of delays and interruptions through the late 1950s, he went off to his summer cottage in Prince Edward County, maps and charts and reams of data at hand, and wrote a draft of the whole thing in about a month – nearly 300 printed pages it ended up. This is what he told me, and I believe him. He made light of it more than once, describing its quantitative research as excessive – like some “classic English plan” from 1934 – and its breadth as totally impractical – “all those words” could never be an official plan (he was right – it never was approved). But clearly he valued it, for he retained copies of the thick, legal-size, cerlox-bound plan nearly fifty years after its creation. It took me a while, but in time I realized how important this plan had been – to my mind the most consequential plan in Toronto’s history. 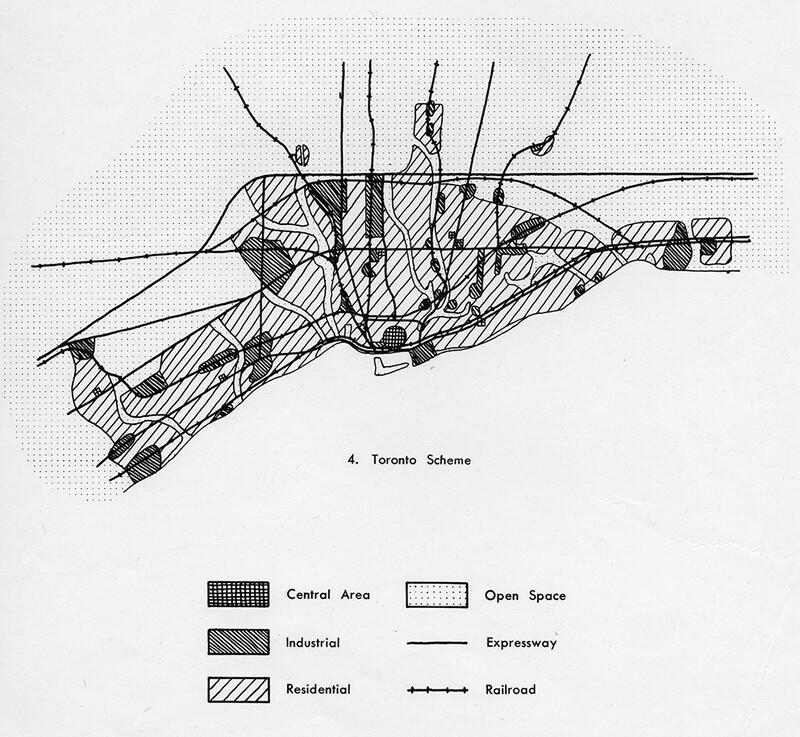 Basic form proposed for the Toronto metropolitan area, from the preliminary pages of the 1959 plan. Unlike almost all other postwar metropolitan plans, Toronto would have no satellite towns; nearly all urban development was to be contiguous. … Waterfront planning is a ridiculous thing – the elaborate schemes that planners cook up provide no public benefit – poll any working class neighbourhood (“are there any working class neighbourhoods left in Toronto?”) to see how much support waterfront planning gets – the only beneficiary of waterfront planning is the Chief Planner, who gains prestige by showing slides of the fancy designs. … Councils of the local municipalities within Metropolitan Toronto were so vulnerable to the influence of private developers that he and the other Metro planners paid no heed to official plans devised by them – the Metro plan called for dispersing industry throughout the metropolitan area not because local plans called for it but because it was the right thing to do. … About his and Blumenfeld’s pasts as communists: it was not significant, to either of them, and they never discussed it – nor did it matter to anyone else at the time, though everyone seemed to know. … By the 1970s Comay had concluded that planning yielded little social benefit – “the arrangement of urban things on the ground” was less important than, say, housing policy – he never really took planning seriously again. … He also came to believe, by the mid-1970s, that development should be permitted unless elected representatives can give good reasons why it should not – is this not in the American Bill of Rights? … The growth of planning through the 1970s was more supply-driven than people realize – the planning problems were no greater, but the graduates of all the new planning schools needed jobs.